With nearly fifty years experience as a luthier, Traphagen guitars are cherished by players of all levels and styles world wide. From the concert stage to the home aficionado these instruments will please the most discerning player. Please enjoy viewing all my various guitars and if there is a custom instrument in your future don't hesitate to contact me. "In all honesty these last few months I was preparing myself in a way to be a little bit disappointed as I thought the guitar could never live up to my expectations and the sound that I had in my head of a perfect guitar wasn't realistic or possible, I was wrong, I'm completely stunned by it. 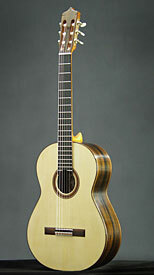 The responsiveness of each string, the articulation and the tone is absolutely gorgeous. The low e string has a 'growl' yet it isn't boomy or muddy, the trebles are rich and fat but with a beautiful shimmer to them. It sounds amazing being played finger style as well as flat picked, I didn't expect that. The ring and sustain sounds like a piano! No sound clip I've heard of your guitars can really do them justice compared to how it sounds in person. The shallower depth is also really welcome as the guitar feels more comfortable, the guitar looks and feels incredible to play. The neck is perfect and so beautiful." This guitar records well in the studio. The craftmanship is first-rate too. Beautiful wood. If you're in the market for a great guitar, this is it. One of the world's most artistic guitar makers. The personality and voice of each instrument express the depth of this luthier's understanding of the true art of guitar making. Series 45 guitars are a batch of four guitars celebrating 45 years of stringed instrument making. These guitars will be completed by early 2015. 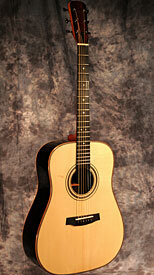 I often have one or two used guitars in the shop.